It’s February and my thoughts are turning to chocolate. Okay, my thoughts rarely turn from chocolate. But February accentuates them. Today’s thoughts take brownie form. Specifically, the memory of a raspberry cheesecake brownie from baked goods company Gluten Free Territory. On my way to meet my parents in Ogunquit, Maine last May I had the pleasure of visiting Gluten Free Territory owners Barbara and Arielle at their production site in Hampton, New Hampshire. Gluten Free Territory was not their first baked goods company. 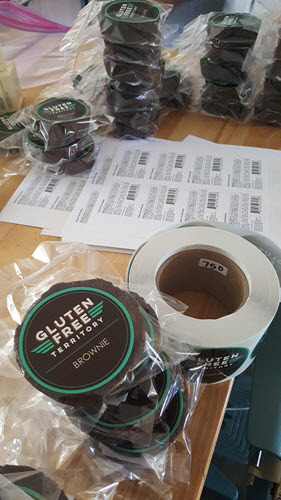 Barbara and Arielle worked quickly and methodically wrapping and labeling brownies as they told me the story of how Gluten Free Territory came to be. Barbara had a friend who had a small brownie business in Amesbury, Massachusetts and who sold to a few local farm stands. In 1995 the friend was leaving the area. Barbara loved to bake and took over the business with her own brownie recipe, figuring she would bring in a little extra income. In the summer of 1998, The Flatbread Company was launching their restaurant chain with a first location in Amesbury. The owners found Barbara’s brownies at a farm stand. On a handshake they struck a deal for Barbara to provide brownies and desserts for their restaurants which now number 18. When Barbara called the restaurants she would identify herself as Barbara Brownie so that they would know who she was. When it came time to incorporate her business that was the name she chose: Barbara Brownie. On a delivery to one of the restaurants several years later, Barbara noticed a table where the parents and some children were enjoying her brownies but a gluten-free child diner was not. Barbara’s mission was to make something where no one ever feels deprived. She felt everybody should be able to enjoy a good brownie. The vision of that child excluded from dessert haunted her. Barbara brought her daughter Arielle into the business in 2008. Together they continued to produce regular brownies and desserts and began formulating a gluten-free brownie recipe with the same high-quality ingredients including unsalted butter, all-natural vanilla and top-grade chocolate chips. After much experimenting the Free-At-Last gluten-free brownie made its debut in 2009. Gluten-free diners would be free at last to enjoy a brownie for dessert alongside their family and friends. From Barbara’s vision of that deprived child, she and Arielle set a goal of enabling gluten-free diners to enjoy dessert worry-free. To remove the possibility of a mix-up between their regular and gluten-free brownies, Barbara and Arielle made the Free-At-Last brownies circular. The Flatbread Company hesitated when presented with a circular brownie, but soon appreciated the operational ease that they had baked in. No risk of serving the wrong brownie and making a diner ill. The success of the Free-At-Last chocolate brownie and the joy it brought to the underserved gluten-free population spurred Barbara and Arielle to broaden their offerings to include additional brownie flavors, cookies and pound cakes. Barbara, Barbara’s husband Ron and Arielle decided that gluten-free was where they wanted to focus the business. Dedicated to the strict guidelines qualifying gluten-free products, they knew they had to get production out of their Hampton, New Hampshire home kitchen. They found a small space in town in 2014, designated it Gluten Free Territory and launched the gluten-free business as a separate entity under that name. Reinvesting their baked goods earnings, they purchased ovens, triple sinks and pans on Craigslist. While Barbara and Arielle still produce regular brownies, cookies and cakes at their original kitchen, marketing funds and efforts focus entirely on Gluten Free Territory, and include trade shows like The Nourished Festival in Worcester, Massachusetts (formerly The Gluten Free & Allergen Friendly Expo). Over time the team has invested in professional photography, new labels, and a new website. In addition to restaurants, Gluten Free Territory sells to local retailers and schools and is available for purchase online. The business is growing. With a successful regular baked goods business, why would this family team choose to focus on such a small part of the market? Serves an unmet need. Delicious gluten-free baked goods are still a challenge for many gluten-free diners to find. Aligns with Barbara and Arielle’s mission of making something where no one feels deprived. Differentiates their business. Few of their local baked goods competitors lead with a gluten-free line. Plays to their brand strength. Barbara and Arielle’s ability to craft delicious recipes mean that their gluten-free creations taste better than most of their competitors’. Brings them joy and enables them to make the world a better place. Successful businesses make a difference in their customers’ lives. The gluten-free niche, while small relative to the total baked goods category, is growing fast. According to Grand View Research the global gluten-free products market was valued at US$14.9 billion in 2016 and North America accounted for 53% of the revenue share. The global market is projected to grow at a compound annual growth rate (CAGR) of 9.3 percent from 2017 to 2025. Bakery products dominate the gluten-free market. Global Market Insights reported that the global gluten-free bakery products market size totaled US$3.5 billion in 2017. Does it matter to Barbara, Arielle and Ron how big the global market is? No. They see a local need and ample room to grow. 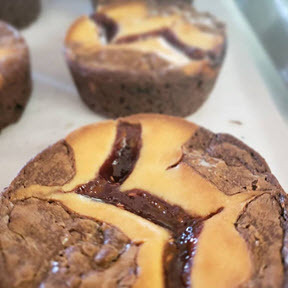 By focusing their efforts on Gluten Free Territory, they are becoming the go-to provider for gluten-free bakery items in New Hampshire, Massachusetts, Maine, Rhode Island and Connecticut. The gluten-free specialty allows them to stand out in a way that selling only regular baked goods did not and that competitors are hard-pressed to match. 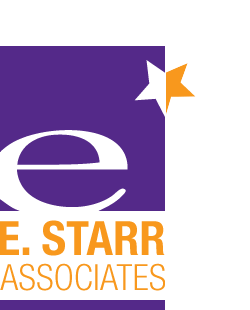 Savvy entrepreneurs look for gaps and underserved areas in the market place which they call “white space”. They know that being first and prominent in an uncontested space with a demonstrated need reduces the risk of investment. Godin calls this the “smallest viable market.” Concentrating your efforts on a group of people who have a common need or worldview allows you to get to know them well, to design specifically for them, and to wow them with your offerings. Niches are a recipe for brand differentiation and growth. Does your brand have a niche? If not, it isn’t too late to develop one. Acknowledge any fear or hesitation to narrow your brand’s scope. This is a human reaction which you can help remedy with data and insights before making changes. Your biggest hurdle to establishing a niche is not finding one, it is fighting your fear and the urge to dilute your nascent niche by not paring non-niche offerings from your brand. Which products or services are truly driving the business? What are you doing that no one else is? Talk to your best customers to learn more about why they come to you. Identify potential niches among your brand strengths as evidenced in the concentration of your sales, the uniqueness of what your brand offers or how it does business, and the reasons your best customers come to you. Confirm your chosen niche and allay your fear of focusing by verifying that the market size is ample enough for your brand to grow substantially. Niches not only help you grow your brand but they make running the business easier as relevance to your niche becomes an easy litmus test for new product ideas, partnerships, marketing communications and operational decisions. After my visit to Gluten Free Territory, Barbara and Arielle sent me on my way to Ogunquit with a raspberry cheesecake brownie. After a filling dinner my parents and I split the brownie by cutting it into quarters. My quarter of that brownie was easily the most delicious two bites of food I had all week. If I hadn’t known it was gluten free I never would have guessed. My father liked it so much that he saved the remaining quarter for the next day. Follow Barbara and Arielle’s lead – excel at a niche, wow your customers and watch your brand grow.